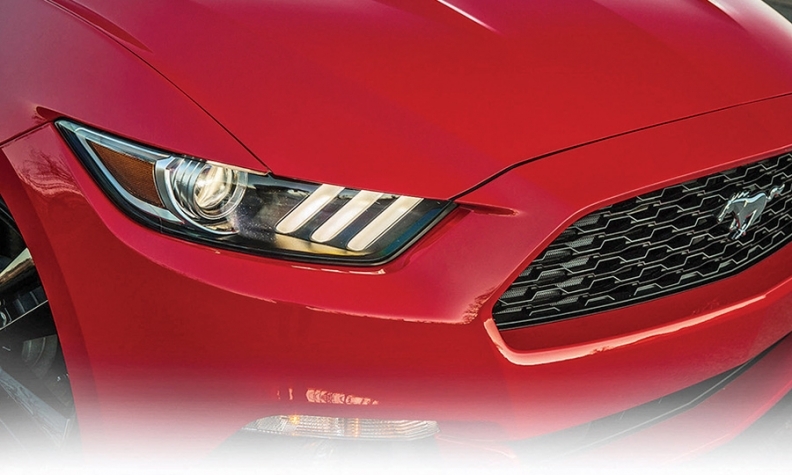 With the 2015 Ford Mustang on its way to dealers, the early reviews are rolling in. Ford has let auto writers test two of the three models, the four-cylinder turbo and the V-8 powered GT. Here's a sampling. from the press. "The interior is more spacious and decidedly less low-rent than the outgoing car. The big, round gauges and the dual-cowl dash remain, but for 2015, Ford used better materials and more soft-touch surfaces in place of hard plastic. In spite of a lower roofline, there's plenty of head and leg room." "Barreling along a tightly twisted canyon road with all the settings turned to Sport Plus, the 435 horsepower Mustang GT glided through turn after turn. It felt easy, balanced and smooth. Even the steering feels decent." "The suspension has cured the Mustang's allergy to bumps. Short of saying that it will eradicate lupus, it's hard to overstate how much the double-ball joint MacPherson struts in front and the multi-link rear suspension mean to the experience. You don't have to wait for the chassis to settle down before locking into a turn." "Everything from the noise that comes into the cabin to the feel through the steering wheel is far ahead of old Mustangs. It's still more of a muscle car than it is a sports car, but it's one of the most refined muscle cars you'll see."